Because humans produce and exhale carbon dioxide (CO2), concentrations of CO2 in occupied indoor spaces are higher than concentrations outdoors. As the outdoor air ventilation rate per person decreases, the magnitude of the indoor-outdoor difference in CO2 concentration increases. Prior research has found that with higher indoor levels of CO2, indicating less outdoor air ventilation per person, people tend to be less satisfied with indoor air quality, report more acute health symptoms (e.g., headache, mucosal irritation), work slightly slower and are more often absent from work or school. It has been widely believed that these associations exist only because the higher indoor CO2 concentrations are a proxy for higher levels of other indoor-generated pollutants that directly cause the adverse effects. Therefore, CO2 in the range of concentrations found in buildings (i.e., up to 5,000 ppm, but more typically in the range of 1,000 ppm) has been assumed to have no direct effect on occupants’ perceptions, health, or work performance. A small study from Hungary1 casts doubt about this assumption. The authors reported that controlled human exposures to CO2 between 2,000 ppm and 5,000 ppm, with outdoor air ventilation rates unchanged, had subtle adverse impacts on proofreading of text in some trials, but the brief report in conference proceedings provided limited details. These results from Hungary stimulated our effort to evaluate effects of variation in CO2 alone on potentially more sensitive high-level cognitive functioning. We investigated a hypothesis that higher concentrations of CO2, within the range found in buildings, and without changes in outdoor air ventilation rate, have detrimental effects on occupants’ decision-making. To test this hypothesis, 22 subjects completed tests of decision-making performance when exposed to low, medium, and high CO2 concentrations for 2.5 hour periods in an exposure chamber. During sessions with low CO2, subjects and outdoor air were the only sources of CO2, and measured CO2 concentrations were approximately 600 ppm. In sessions with CO2 at the medium and high levels, 99.9999% pure CO2 was added to the chamber supply air at the rate needed to increase the CO2 concentration to either 1,000 or 2,500 ppm. All other conditions (e.g., ventilation rate, temperature) remained unchanged. Each subject experienced all three CO2 conditions on the same day, and the order of sessions (low, medium, high; medium, low, high, etc.) was varied, as needed, among the subjects to cancel out effects of order of exposure. Three different versions of the decision-making test were used in a manner such that findings were not affected by differences in test difficulty. Subjects were not informed of the CO2 conditions. Performance in decision making was evaluated using the Strategic Management Simulation (SMS) designed to assess complex cognitive functioning. The parameters of decision making determine day-to-day productivity and are important for overall functioning. SMS users are exposed to diverse computer-generated real-world equivalent scenarios that match real-world day-to-day challenges and convey their decisions through a computer interface. The validated measures of task performance vary from relatively simple competencies such as activity and task orientation, through intermediate level capabilities such as initiative and use of information, to highly complex thought and action processes such as breadth of approach to problems and strategy. SMS scores predict real-world success as judged by peers and as demonstrated by income, job level, promotions, level in organizations. In other words, the SMS assesses capacities required for day-to-day routine tasks as well as higher level decisions people make at home and work. The SMS, described in greater detail in the documents cited in Reference 2, is available for research through the State University of New York, Upstate Medical University. The main results are depicted in Figure 1. 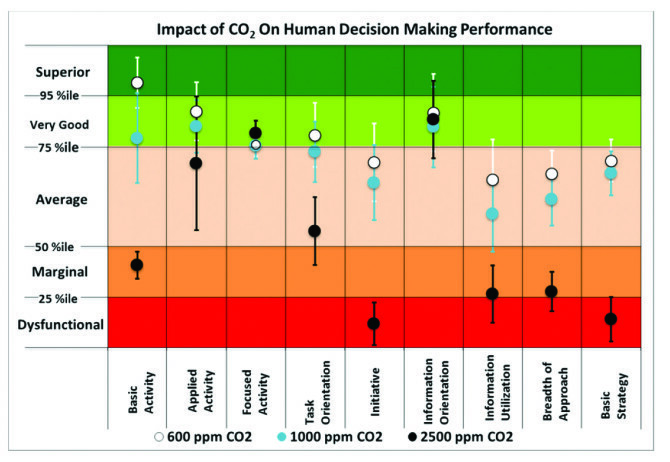 The data indicate that at 1,000 ppm CO2, relative to 600 ppm, there were moderate and statistically significant decrements in six of nine scales of decision-making performance. At 2,500 ppm, large and statistically significant reductions occurred in seven scales of decision-making performance, but a small increase in performance was seen in the focused activity scale. For some scales of performance, the reductions were dramatic. More details are provided in Reference 2. The real-world significance of our findings depends upon the extent to which CO2 concentrations are at, or above, 1,000 and 2,500 ppm in current or future buildings. In surveys of elementary school classrooms in California3 and Texas, 4 average CO2 concentrations were above 1,000 ppm, a substantial proportion exceeded 2,000 ppm, and in 21% of Texas classrooms peak CO2 concentration exceeded 3,000 ppm. In a representative survey of 100 U.S. offices,5 only 5% of the measured peak indoor CO2 concentrations exceeded 1,000 ppm, assuming an outdoor concentration of 400 ppm. A very small study suggests that meeting rooms in offices, where important decisions are sometimes made, can have elevated CO2 concentrations. The dramatic direct influence of CO2 on decision-making performance was unexpected, and the study needs to be replicated. The findings of this study, if replicated, have implications for the standards that specify minimum ventilation rates in buildings, and indicate the need to adhere more consistently to the existing standards. Many of the elevated CO2 concentrations observed in practice are a consequence of a failure to supply the amount of outdoor air specified in current standards; however, even the minimum ventilation rates in ASHRAE Standard 62.1-20106 correspond to CO2 concentrations above 1,000 ppm in densely occupied spaces. There is a current interest in reducing ventilation rates to save energy and reduce energy costs. Yet, large reductions in ventilation rates could lead to increased CO2 concentrations that adversely affect decision-making performance, even when indoor air concentrations of other air pollutants are maintained low through implementation of pollutant source control measures or application of gas-phase air cleaning systems. Kajtar, L., et al. 2006. “Influence of carbon dioxide pollutant on human well being and work intensity.” In Proceedings of Healthy Buildings 2006, pp. 85 – 90. Satish, U., et al. 2012. “Is CO2 an indoor pollutant? Direct effects of low-to-moderate CO2 concentrations on human decision-making performance.” Environ Health Perspect 120:1671 – 1677. Whitmore, R., A. Clayton, G. Akland. 2003. “California portable classrooms study phase II: main study, final report, volume II.” California Air Resources Board. Corsi, R.L., et al. 2002. “Carbon dioxide levels and dynamics in elementary schools: results of the TESIAS study.” In Proceedings of Indoor Air 2002, pp. 74 – 79. Persily, A.K., J. Gorfain. 2008. “Analysis of ventilation data from the U.S. Environmental Protection Agency Building Assessment Survey and Evaluation (BASE) Study.” NISTIR-7145-Revised. ANSI/ASHRAE Standard 62.1-2010, Ventilation for Acceptable Indoor Air Quality. William J. Fisk is senior scientist and leads the Indoor Environment Group, Lawrence Berkeley National Laboratory (LBNL), Berkeley, Calif. Usha Satish is a professor in the Department of Psychiatry and Behavioral Science at the State University of New York Upstate Medical University, Syracuse, N.Y. Mark J. Mendell is staff scientist, Toshifumi Hotchi is principal research associate, and Douglas Sullivan is principal scientific engineering associate at the Indoor Environment Group, LBNL.